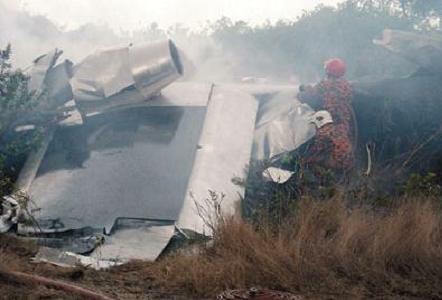 August 16, 2009, aviation pioneer and business entrepreneur Michael Robert Dacre, age 53, was killed in a test run today when his newly assembled prototype aircraft “Jetpod” crashed just after takeoff at Tekah Airport in Taiping, Malaysia. Pilot Dacre had made three unsuccessful attempts to get the aircraft off the ground. On the fourth attempt the Jetpod climbed to an altitude of about 656 feet when it stalled and then crashed to the ground bursting into flames. Pilot Dacre was the only person onboard. His copilot wanted to fly along however, Dacre decided to fly alone. The Jetpod was designed to be a quiet aircraft that could take off and land in short distances. Developed by Michael Robert Dacre, owner of Avcen Limited, a company formed in 1998 to promote development of the Jetpod. A number of applications were proposed for this aircraft, including as a military transport, an executive transport, and as a short to medium-range air taxi. Commuters would be able to use the Jetpod as a flying taxi, taking them to and from work instead of waiting for a street cab. According to Avcen Limited the Jetpod was designed to reach speeds of 350 MPH and would be able to land and take off on a 410 foot runway. A promotional video stated the Jetpod would operate from aircraft carriers without the need for a catapult of arrester gear. Using thrust management technology, the VQSTOL (Very Quiet Short Take-off and Landing) jetpod also would be capable of reducing the noise of a regular jet engine by 50 percent, making it more comparable to a busy road. Full-scale factory production was scheduled for 2011. However, Avcen was not accepting deposit checks for future aircraft and would sell only what it could produce off the production line.